Time for another trip! After heading to a very chilly Berlin back in February, I’ve decided to continue my travels around Europe, visiting three Nordic countries I haven’t set foot in before. I did Denmark two years ago, Iceland recently, and Norway way back when I was about five. 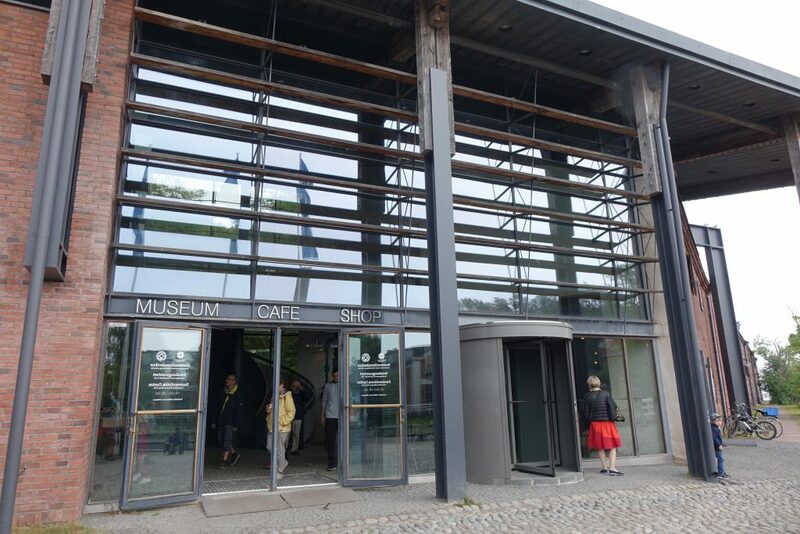 Still remember bits of Stavanger! 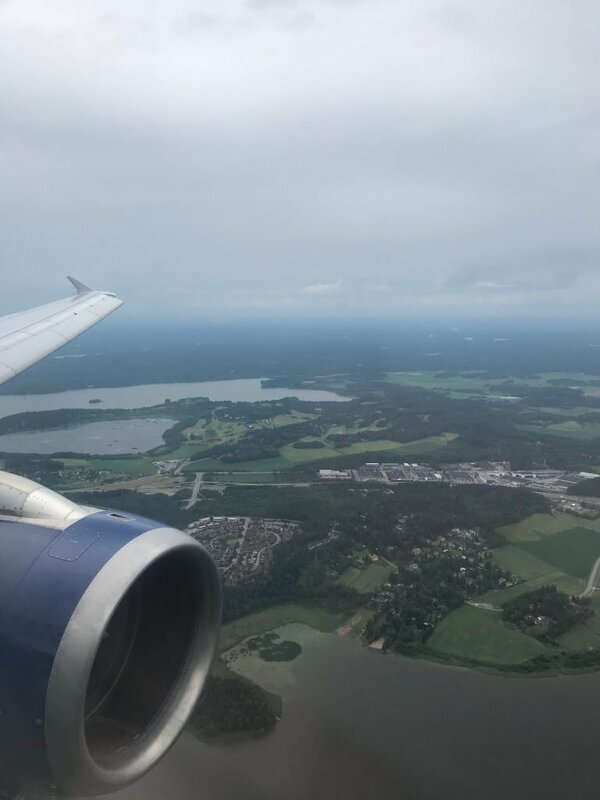 This time around, my trip began with a drive down to Dublin – and an overnight stay before catching a flight to London early the next morning. After changing terminal there, I had a quick visit to the Cathay Pacific lounge in Terminal 3. 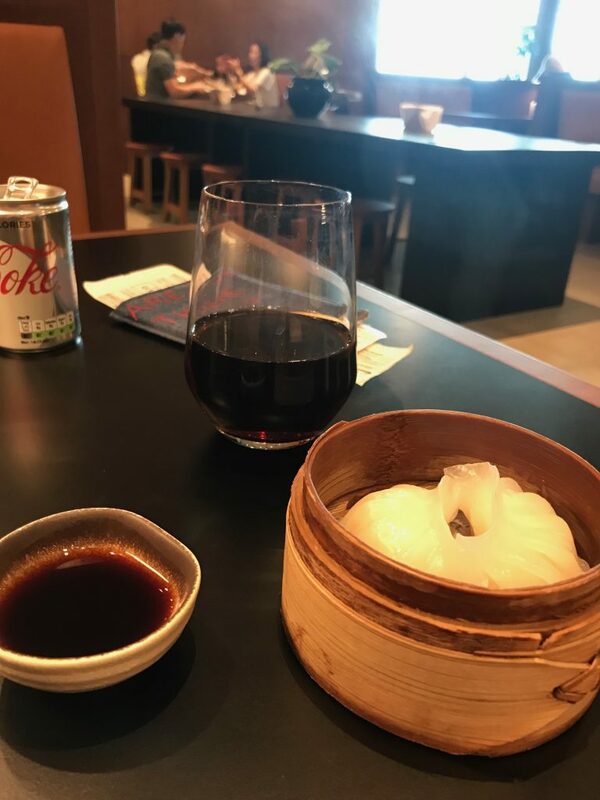 If you have Oneworld status I’d definitely recommend it – it’s way better than the BA lounge. They even have a noodle chef! I just had some dim sum as I’d had breakfast on the plane. 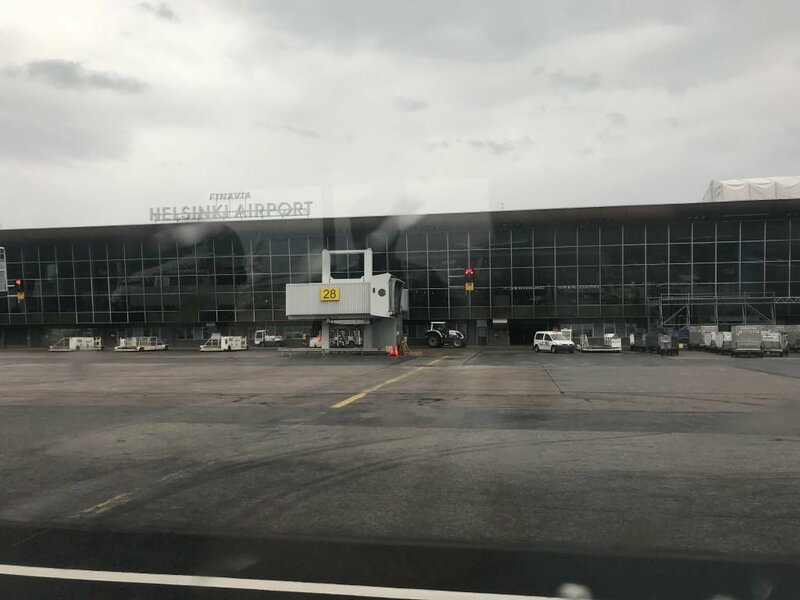 Before I knew it, it was time to get on another ‘plane – this time bound for Helsinki! 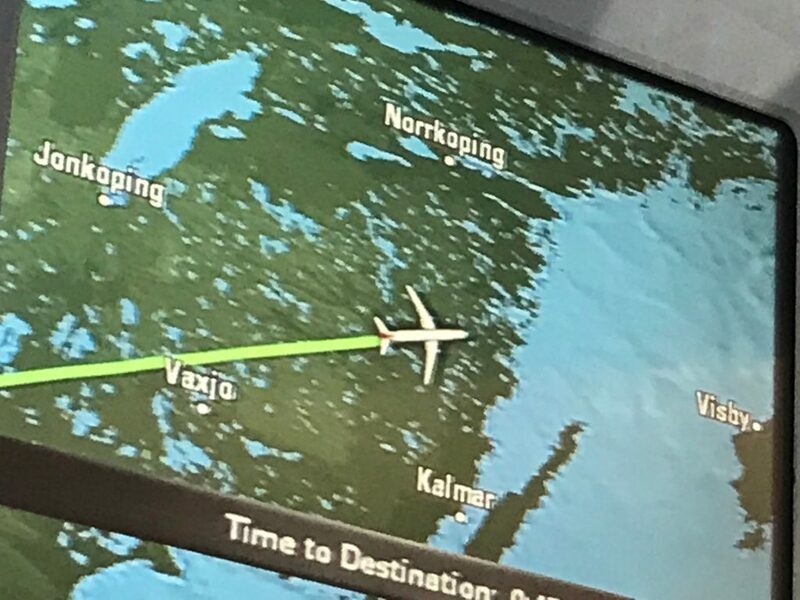 The two and a half hour flight went fairly quickly thanks to some Netflix shows I’d downloaded, and soon the flight map was showing some very Scandinavian looking place names – we were nearing our destination. Touching down, the weather looked absolutely miserable! I’d been keeping an eye on the forecast before I left, and the sun had been shining most days. Just my luck! It was a bus to the terminal (grrrr) then a walk the length of the entire building it seemed. But my bag was already on the belt by the time I reached it – pretty efficient! 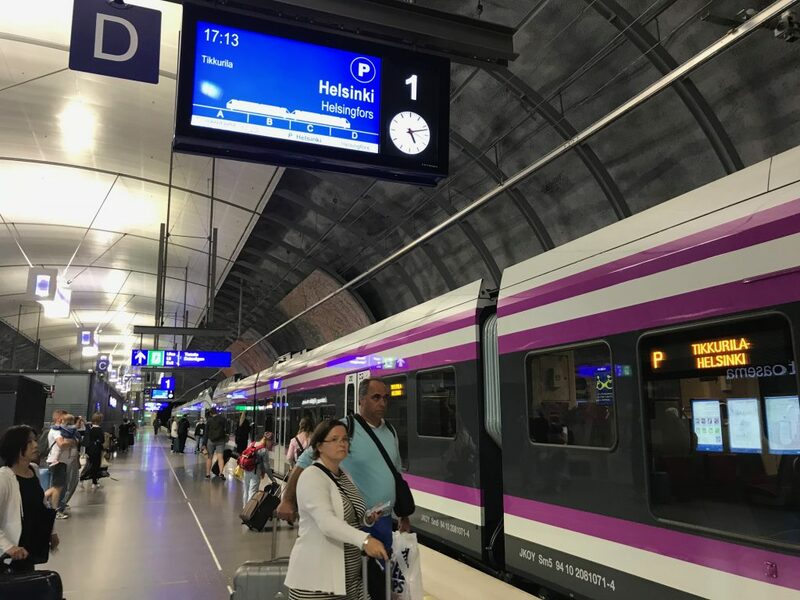 Immigration literally took ten seconds, and after getting to the train station platform, two minutes after I bought my ticket, I was on my way into Helsinki. 30 minutes later we arrived. 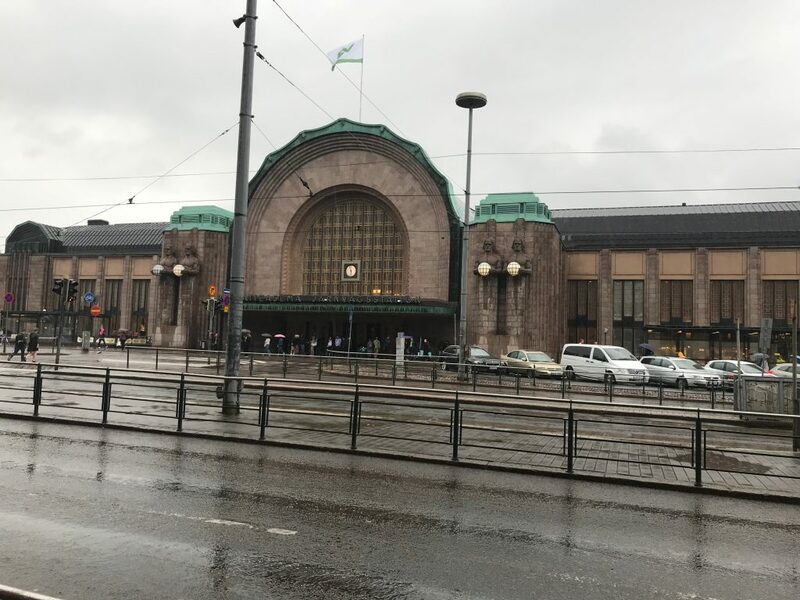 I navigated through the station and went to walk outside only to be greeted by torrential rain. So I had to go in search of a shop that sold umbrellas. Which, as luck would have it, was at the complete opposite end of the station. Though I’d tried to pack light, my suitcase was weighing in at 20Kg. I was already fed up dragging it around and still had to get to my hotel which was a good 15 minute walk away. In the rain! I’m not gonna lie – the walk wasn’t pleasant. Just as I thought I was nearly at my hotel, I was faced with dragging my suitcase up a steep street. Like San Francisco style steep (well maybe that’s an exaggeration). Needless to say I was wet – and sweaty when I eventually arrived. After a smooth check in, I grabbed a quick shower. 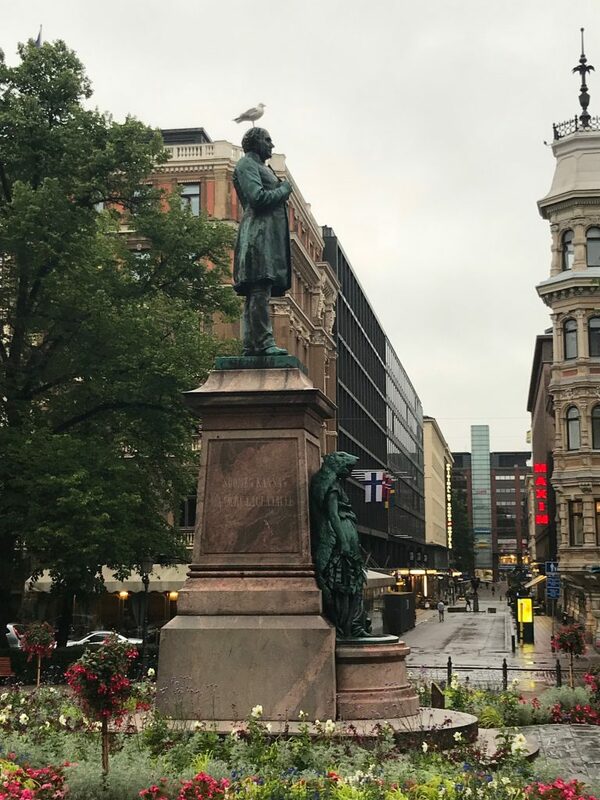 I picked up a couple of USB chargers from Clas Ohlson, and wandered around the food hall in Helsinki’s main department store before grabbing a sandwich from a nearby supermarket and heading back to my hotel. After watching a bit of From Russia With Love on TV (I still find the woman with the knife in her shoes terrifying), pretty quickly I was asleep – with my alarm set for 8am…. Next morning, I hit snooze on my alarm a good couple of times, before reluctantly dragging myself out of bed. 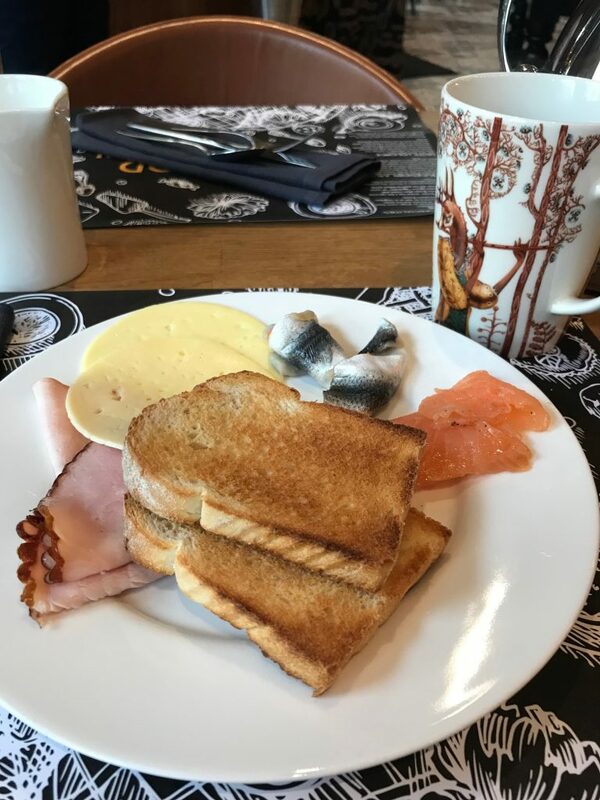 After a shower, I was still feeling in a bit of a daze when I headed downstairs for a bit of breakfast – including one of my all-time favourites! Rollmop herring. Love a bit of rollmop! 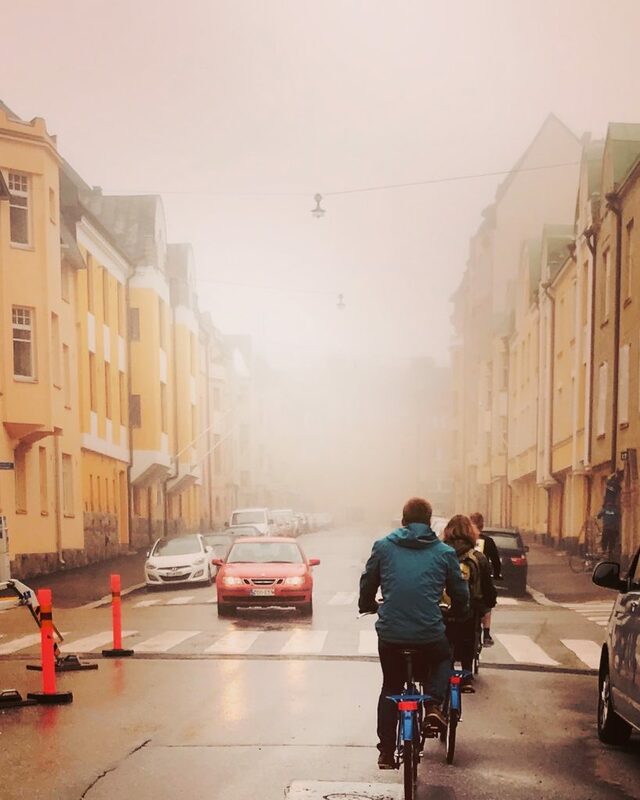 Outside, it was grey and misty – not great, but it wasn’t too cold, and more importantly it was dry. 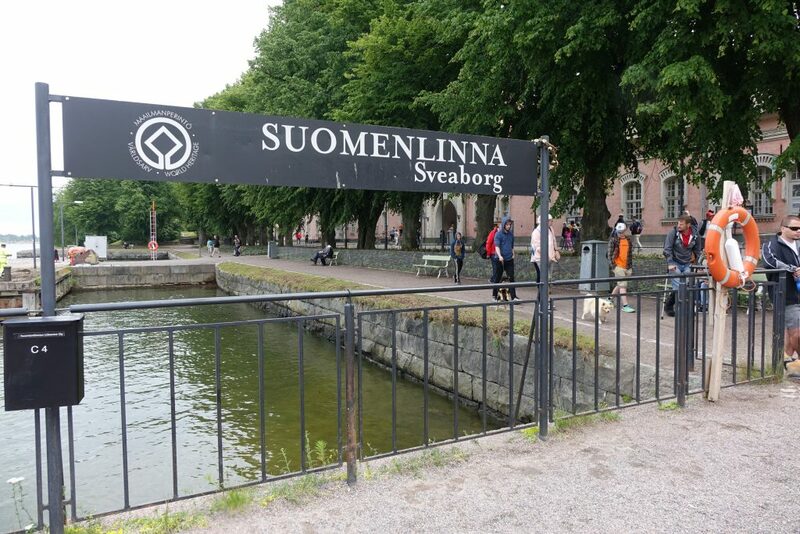 Just a two minutes’ stroll around the corner, was the meeting point for the first Helsinki activity I’d planned – a bike tour. 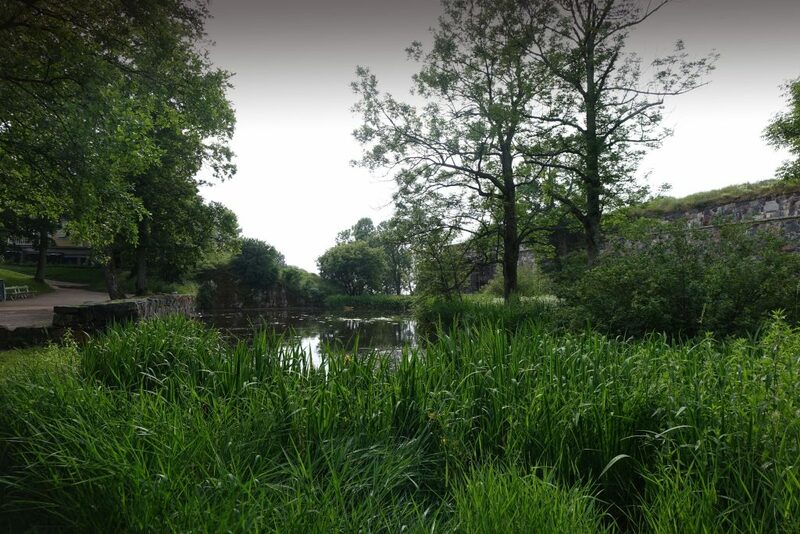 I met my guide and two other tour participants from Belgium – one of whom weirdly was living in St Andrews, just a stone’s throw from my home town! After a quick saddle adjustment, we were on our way. Our tour guide was a concierge in a nearby luxury hotel, which was great – he really knew his stuff. 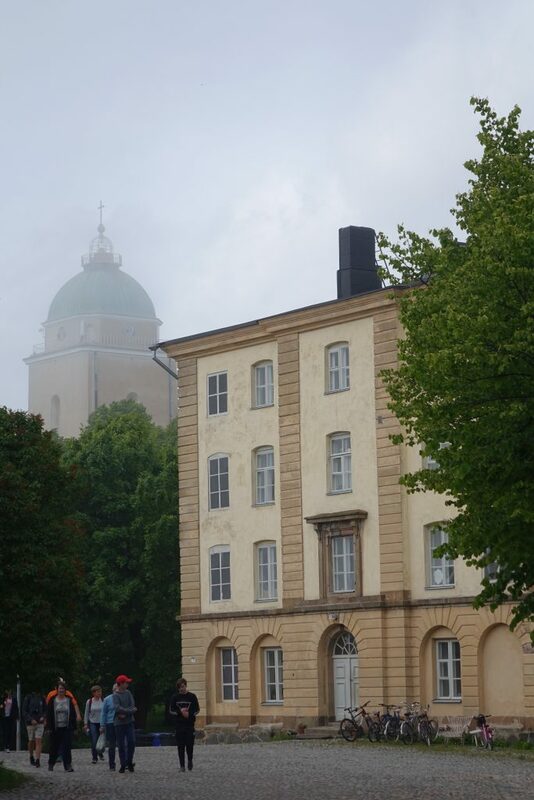 Stopping off at the Russian Embassy, he told us about Finland’s close history with the country, and then we were off to a vantage point in a park to see the Baltic Sea. 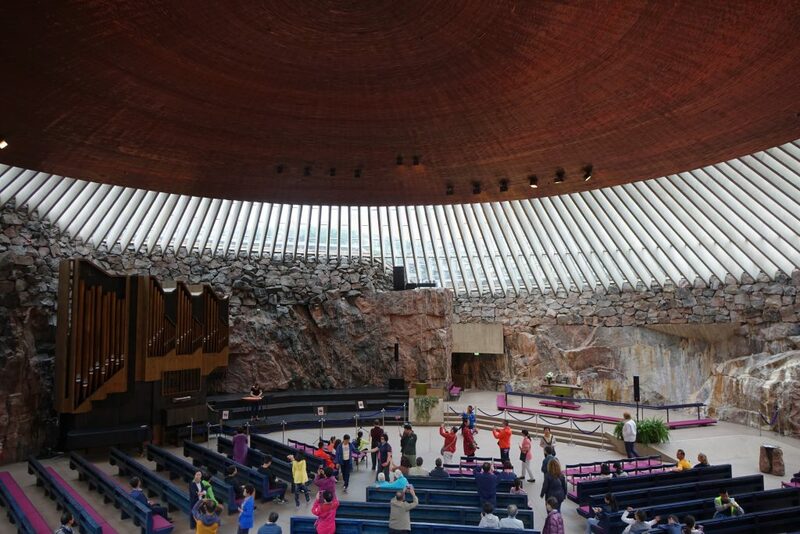 We rode through the colourful streets, and along the harbour front stopping along the way for snippets of Helsinki information, before we arrived at what’s become one of Helsinki’s biggest tourist attractions – Temppeliaukio Church. After two previous unsuccessful architecture competitions to build a church in the area, in 1961 a third competition was won by two architects. But public opinion was against their plans – which would see the church built directly into an existing rock. 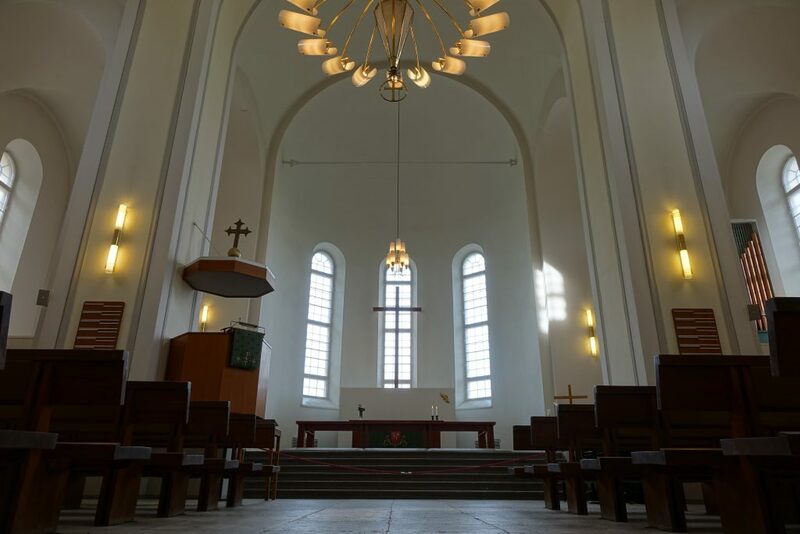 Eight years later the church was dedicated, and the church was regularly full during services. The next year over half a million visitors passed through its doors, and today there’s apparently 10 weddings a day held there. So I think it’s been a success! It was busy when we pulled up – hoards of tourists with cameras at the ready were piling through the doors. Stepping inside, it’s pretty amazing what the architects achieved. It’s a big open space, but it feels welcoming, warm, and dramatic at the same time. There was a lady on stage playing some weird kind of flat-on-a-table-harp-type instrument but despite repeated announcements for silence, it was impossible to hear the music above the chatter from everyone going around taking photos. 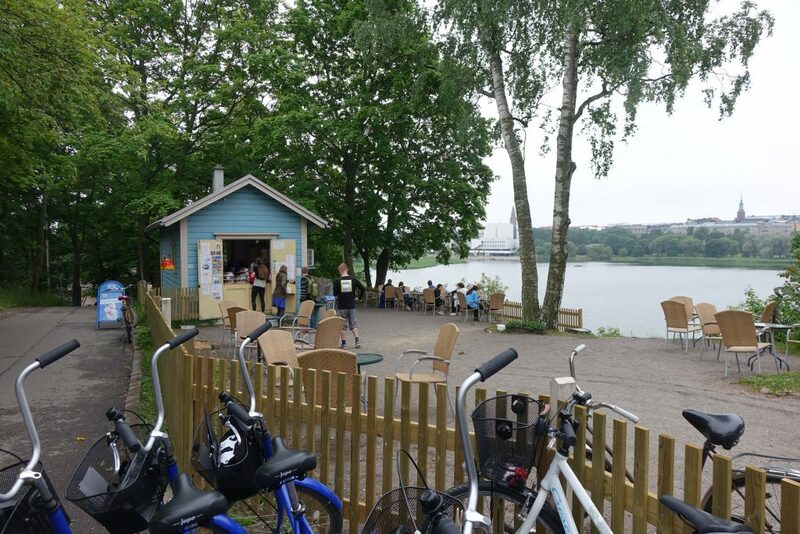 After a quick look around, we were back on our bikes, pedalling past the Finnish parliament building, through greenery and up a fairly steep hill to a little cafe overlooking a lake. Over a coffee we chatted and soon the conversation turned to Brexit. The girl living in St Andrews said she felt she had no choice but to return to Brussels after the Brexit result, and I felt a bit sorry for her as she revealed how after three years there, she had thought the UK would be her home forever. She’d be heading home in three months. Flippin’ Brexit! After our coffees, it was back on the saddle one more time, as we cycled to a hotel where we dropped our bikes off, and the tour finished. I’d had a good time – it had stayed dry, and I’d seen a fair bit of the city, although not the centre – and I’d completely failed to keep my bearings, which is one of the reasons I’d wanted to take the tour in the first place! The tour cost €60, which I think is pretty expensive compared to other cities, but overall I’d recommend it. I headed back to the hotel and had a quick shower before heading out to grab a spot of lunch. Ten minutes away was a little taco place I’d heard about, and I thought that would make the perfect lunch. Cholo can apparently get busy at lunchtimes, but I’d missed the rush when I arrived. it doesn’t look like it in that picture, but there were other people in there! 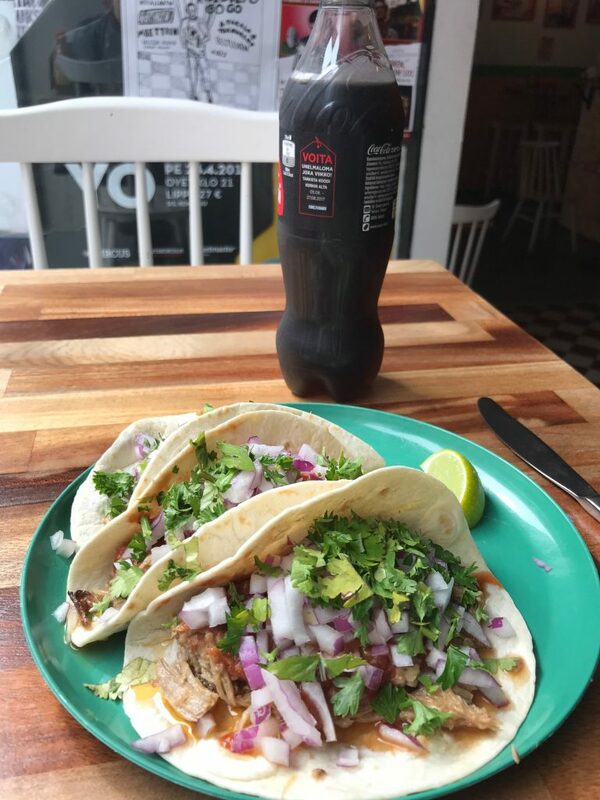 I ordered some pork tacos, and was soon tucking in to them – all that cycling had given me an appetite. They were tasty, but messy, so I resorted to cheating and using cutlery. 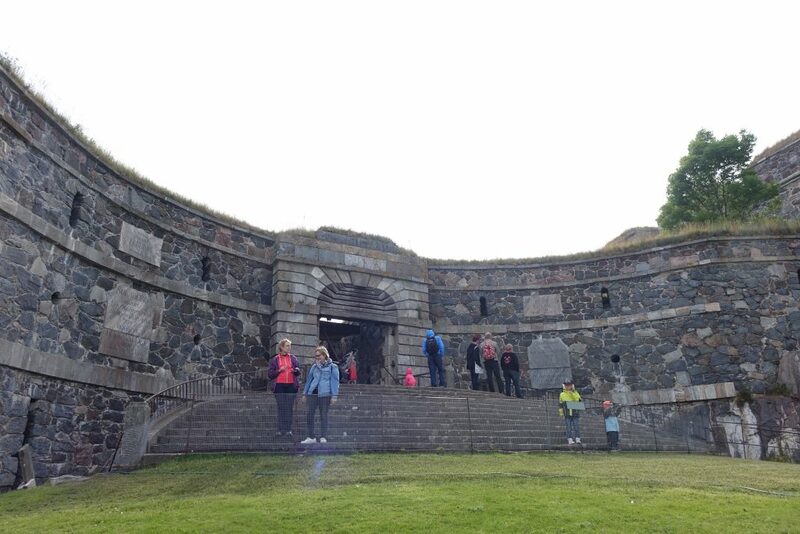 Next stop of the day was another major Helsinki attraction – and a UNESCO heritage site. 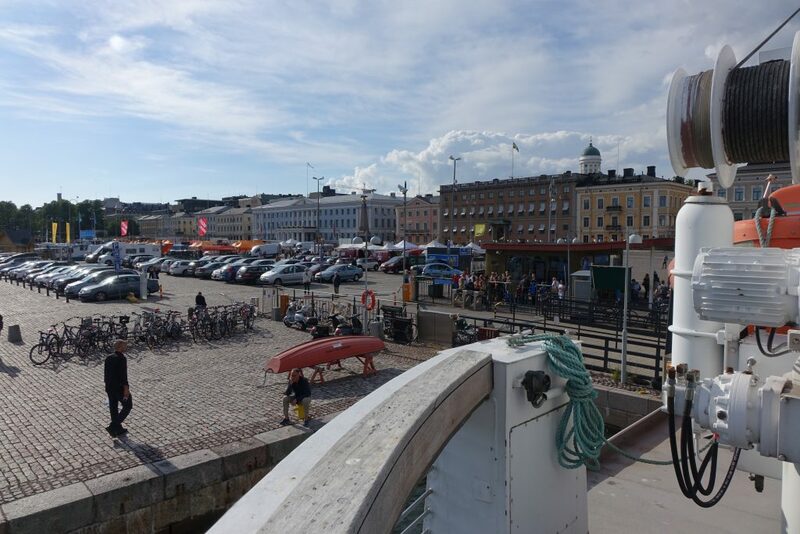 I walked to Market Square, which seemed like a bit of a tourist trap – there were tour boat stands all over the shop, and stalls selling everything from dodgy looking hats to reindeer skins. 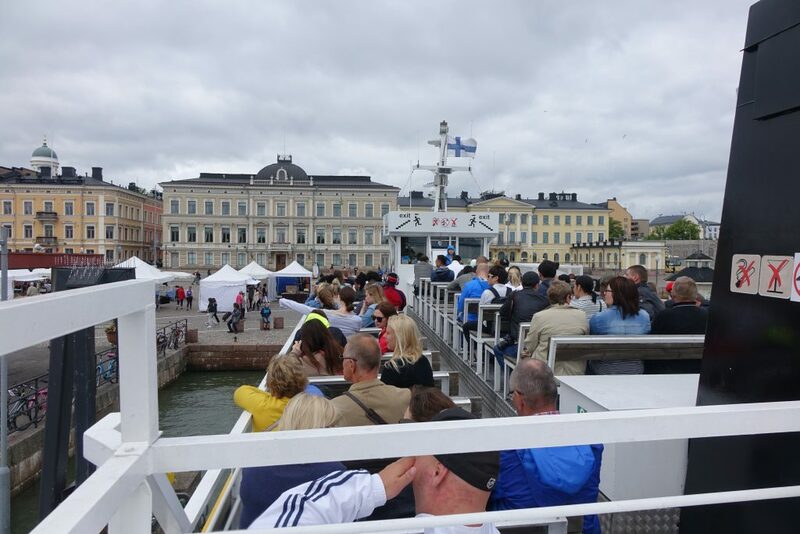 Seeing a ferry was departing in two minutes, I rushed to get a ticket, and jumped on board. 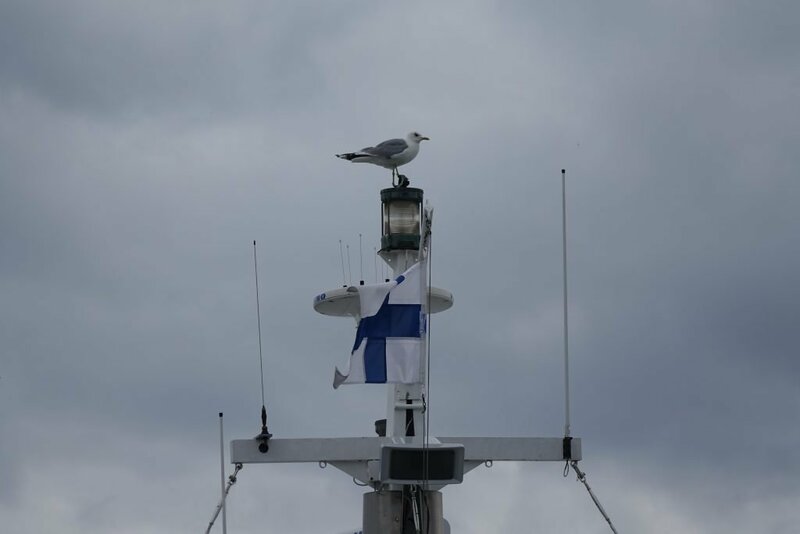 We set off on the fifteen minute journey to Suomenlinna – joined by another perching seagull. They’re everywhere! 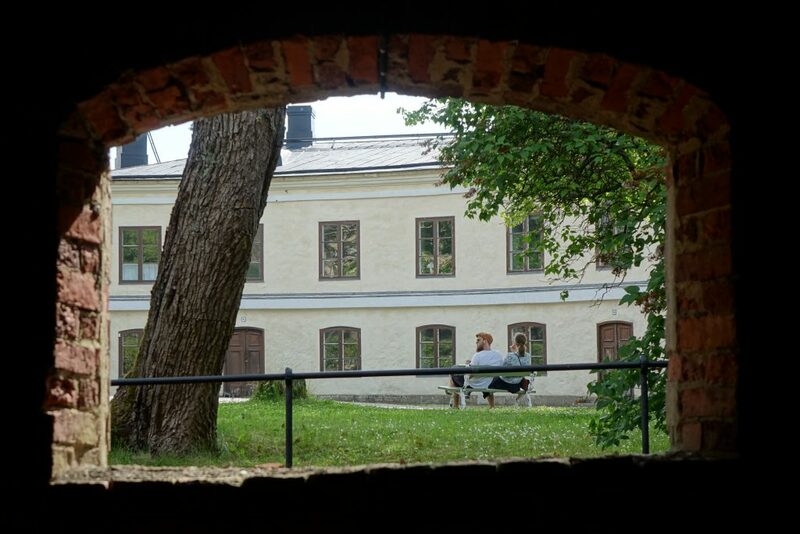 Suomenlinna’s a sea fortress built on a group of islands, but there’s more to see there than just the bits of the fortress still standing. Disembarking at the small jetty, I picked up a map which marked a recommended walking route to the King’s Gate at the other end of the islands, and which would take me past all the major sites on the island. Then I set off through a pretty archway. 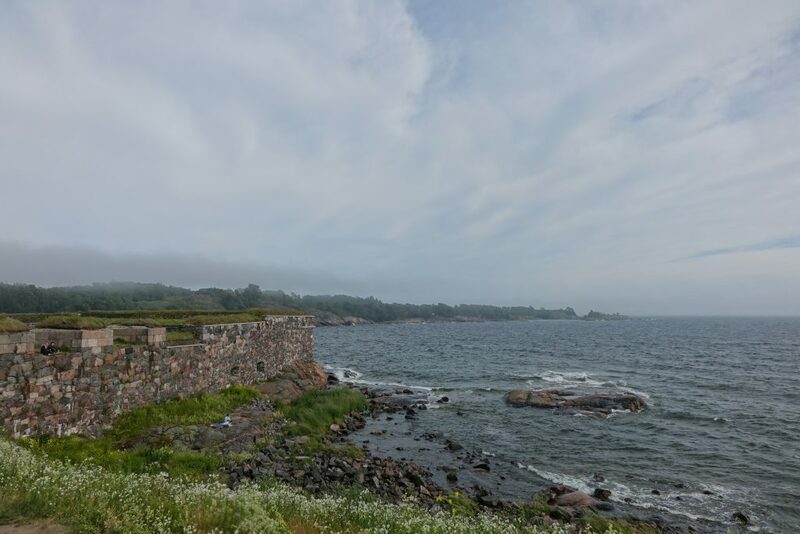 As well as the sea fortress, Sumonelinna’s home to six museums – covering everything from toys to the history of smuggling and customs. 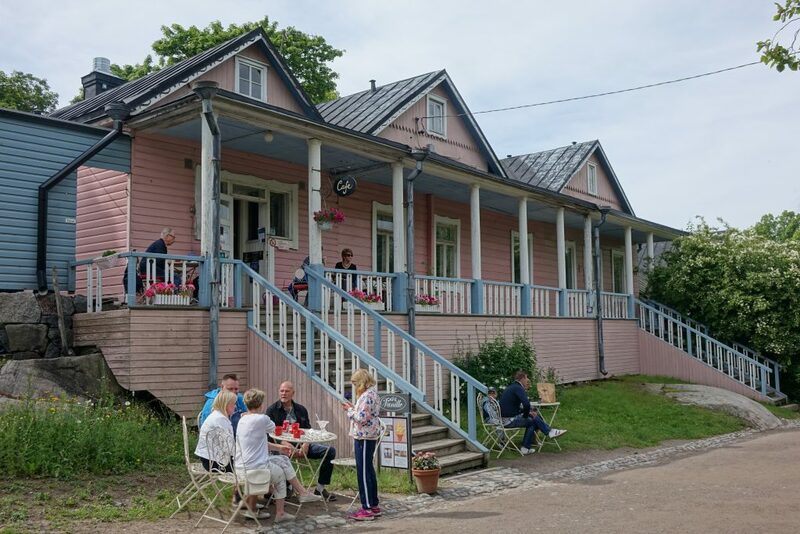 There’s eleven different cafes and restaurants, but Sumonelinna isn’t just a tourist attraction. The islands are also home to around 800 residents. And it’s free to visit – you just pay an entry fee to the museums. …and came across the first landmark on the map – a church built as a Russian Orthodox Church in 1854. Though it originally had five steeples with domes, today there’s only one. Probably its most unique feature though is the fact that it’s a lighthouse too. 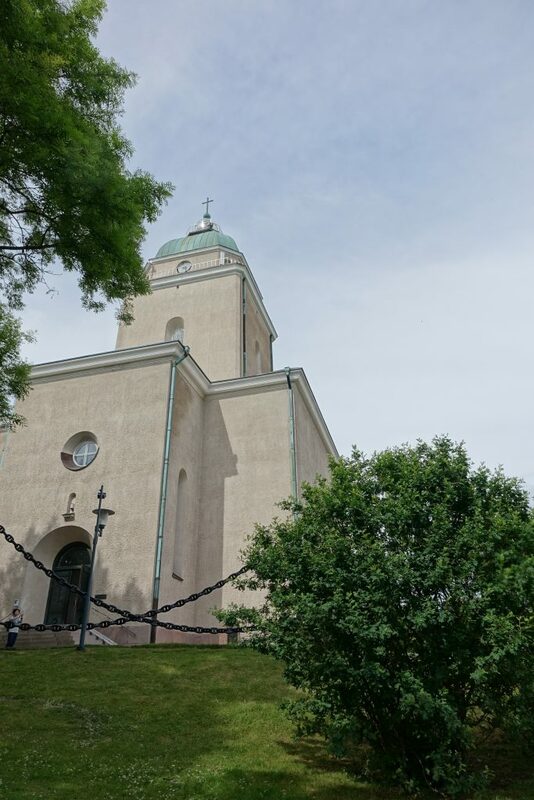 Its steeple houses a beacon for ships which emits four consecutive blinks – Morse code for H, which of course stands for Helsinki. Cool fact! Then carried on walking and taking photos on the way. 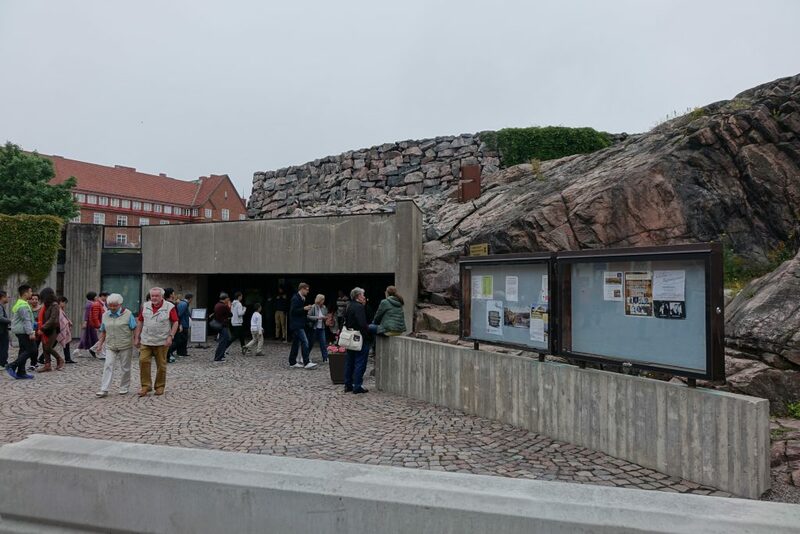 After a while, I reached the Suomenlinna Museum, and I thought it only right I paid the entrance fee and went in to learn a bit about the history of the place and why the fortress was built in the first place. The museum was split over two levels, and was pretty interesting. 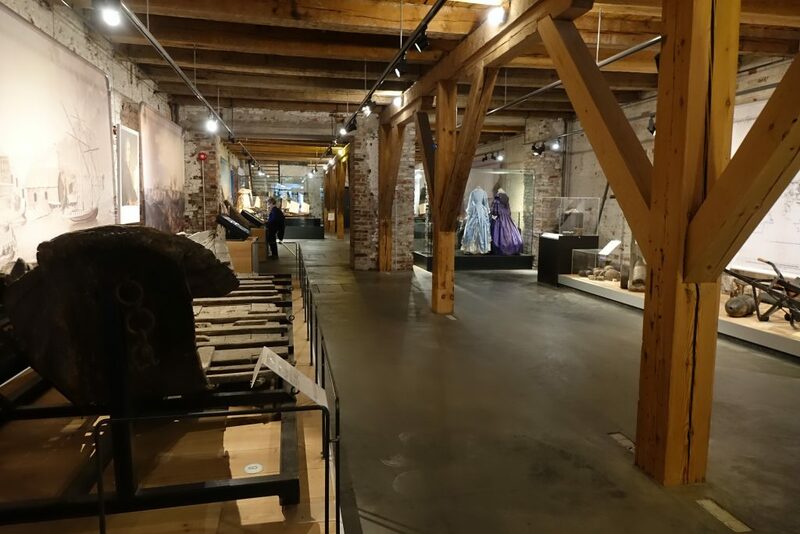 There were lots of old bits and bobs from the islands’ history, and I learned a bit about Finland’s history in general too. There was also an exhibition about some of the islands’ residents. I always judge a museum by whether or not there are buttons to press. This one did have interactive screens, but they kind of just repeated what was on display on boards. I got a photo of one. No particular reason. Heading back outside I carried on with my walk, stepping up the pace a bit as I needed to catch the 6pm ferry back to town. There were plenty of scenic spots, so it was a pleasant dander. 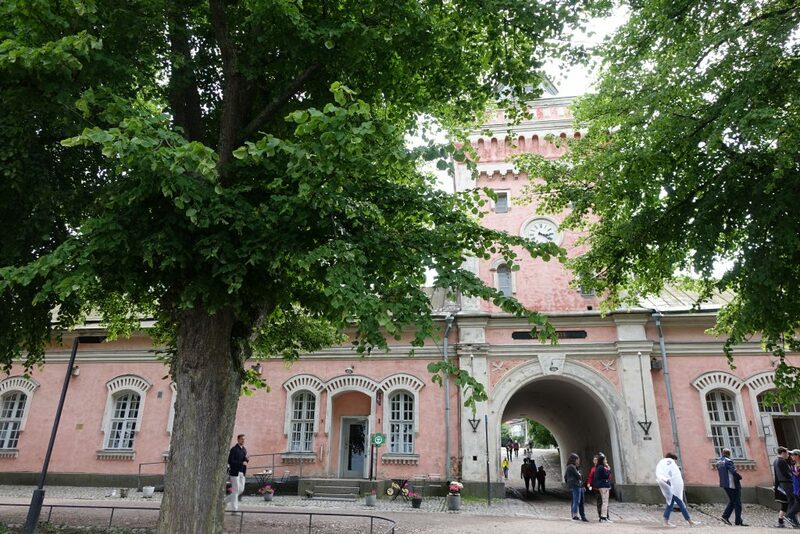 Eventually I got to the King’s Gate – which is where the King of Sweden landed many moons ago to visit the fortress. 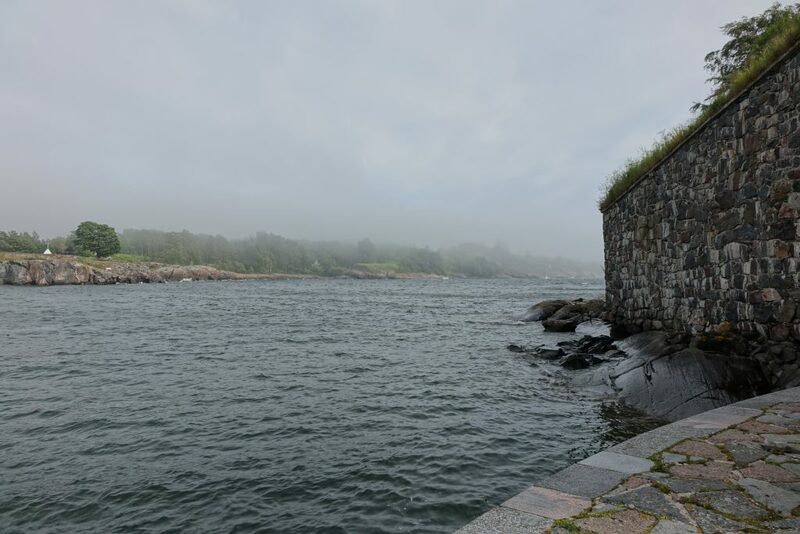 You could spot other islands from the shore, and the weather made them look a bit mysterious. 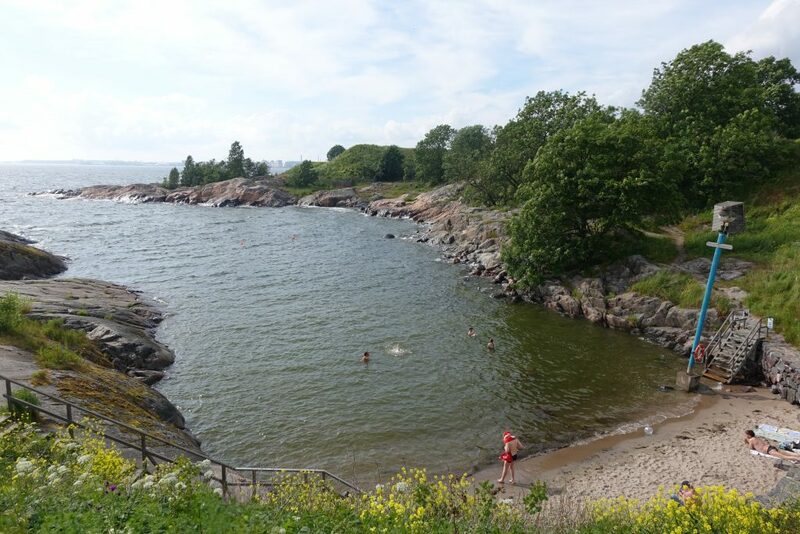 …sunbathing (the sun was slightly peeking through the clouds by now), and there were even kids swimming in the sea. 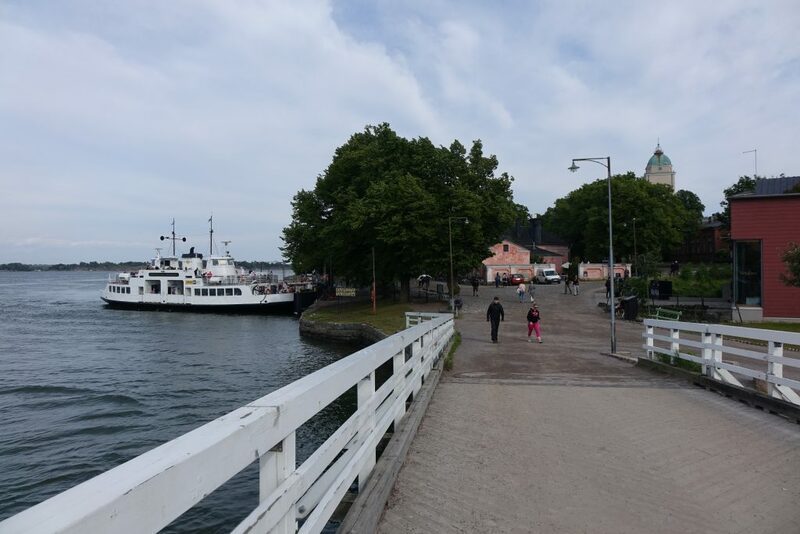 Arriving back at the dock, I nipped into the island’s small supermarket to pick up a snack. I grabbed a sausage roll and joined the checkout queue behind two absolutely hammered dodgy blokes covered in tattoos buying more alcohol. Don’t think they’d spent the day sightseeing judging by the sheer reek of drink coming off them! I was looking forward to a bit of a meaty snack, so imagine my disappointment when I bit into it and tasted not sausage but fruit. Looks like a sausage roll right? 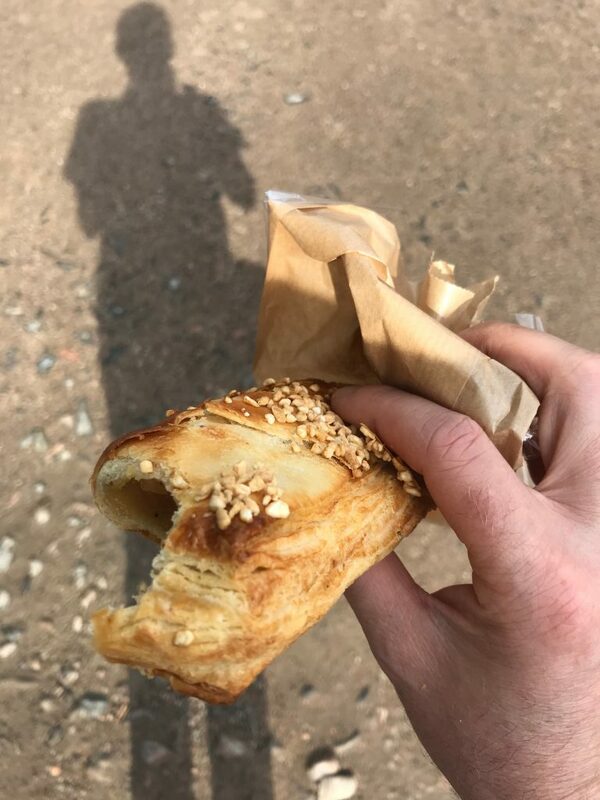 It was some kind of sweet pastry 🙁 I ate it anyway! And then got back on the ferry. 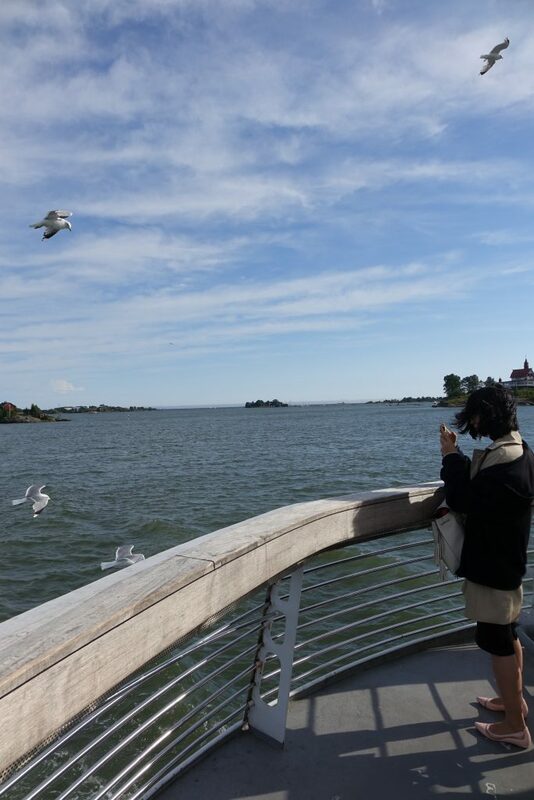 And to elicit a squawk from a tourist! Back on land, the sun was actually out in Market Square as the stall holders packed up their vans. I hopped across the street and jumped on a tram, as I had one last appointment of the day. 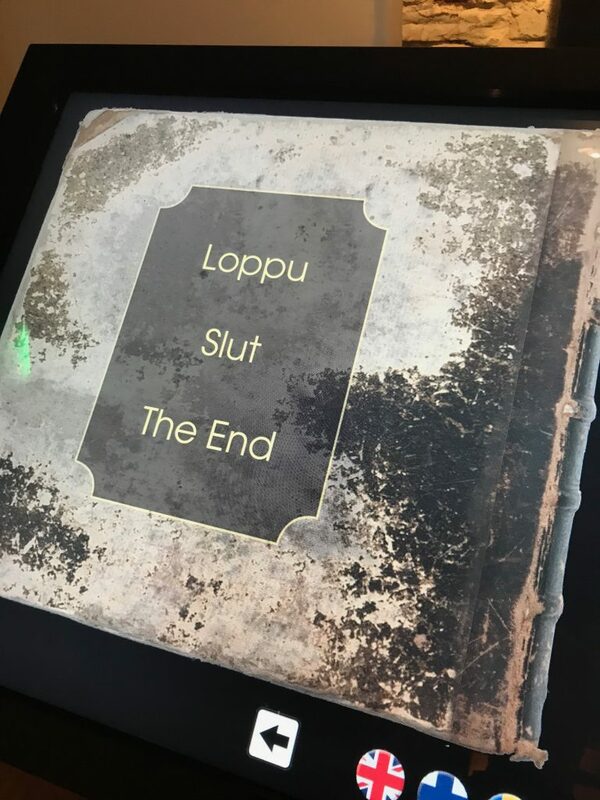 As I predicted, I was feeling pretty wrecked by now, so I’d booked in for a typical Finnish experience – a sauna. 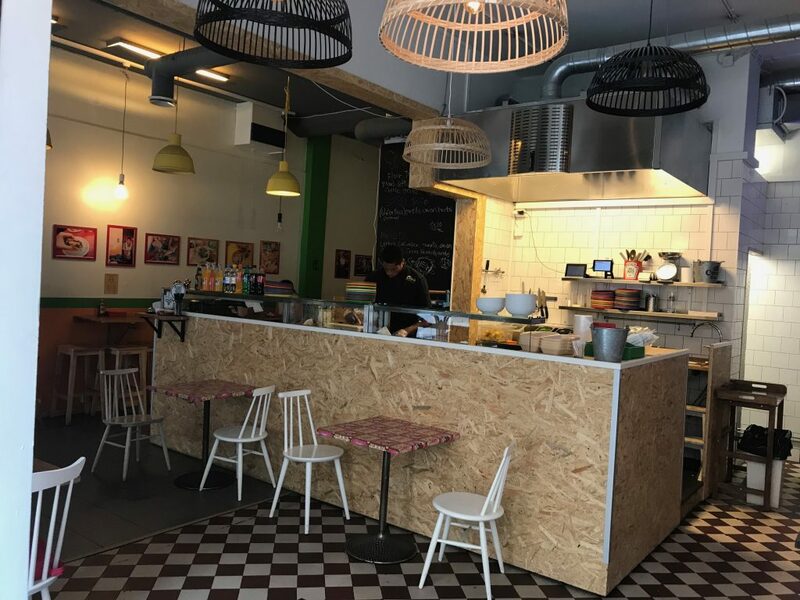 Löyly is a bit of a modern take on the tradition. 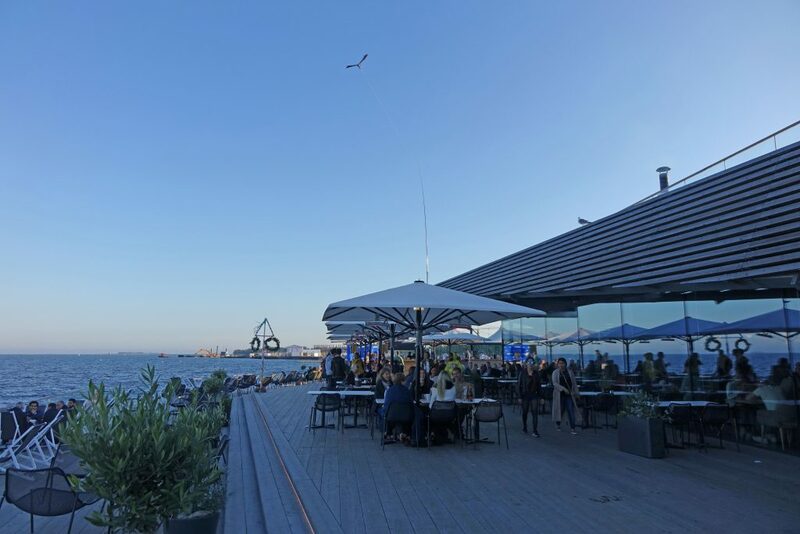 It’s pretty new, housed in a really cool looking building, and is also home to a buzzing restaurant / bar, and a terrace with a DJ spinning da tunes. Booking’s recommended – I’d done that a week or two before leaving the UK. Entry costs €19, which includes a towel, a seat cover and some shower gel and shampoo. Don’t forget to take your swimsuit! After checking in, and getting changed, I headed in to the first sauna. No photos here I’m afraid, but you can see pictures of the saunas on the website (just scroll down). There’s a smoke one, and a dry one. First for me was the smoke one. It was absolutely, absolutely boiling hot in there. And busy! Someone had to budge up to give me a seat. As I sat sweltering and old man beside me started thrashing his wife with birch branches. On her back mind you, not her face. It sounded harsh, but I guess it was refreshing! 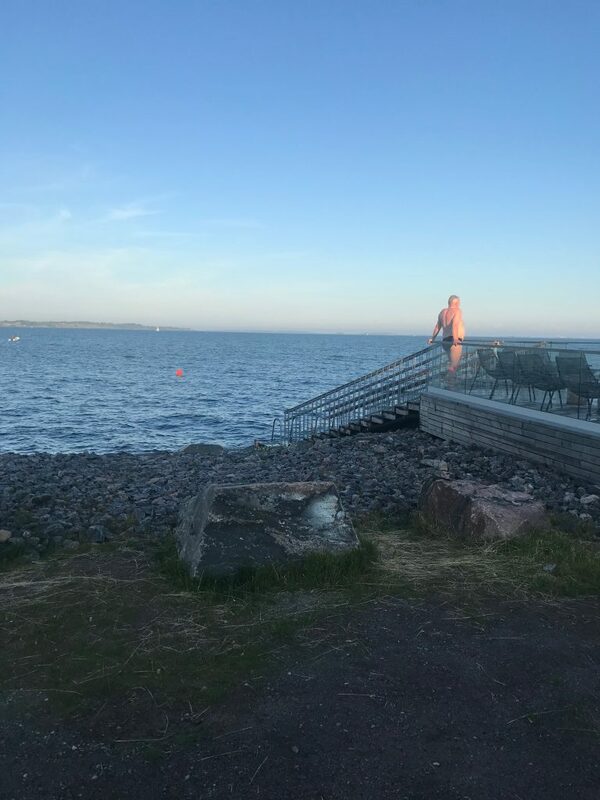 I could only stand the heat for a couple of minutes, so being very conscious of what happened with one of my heat experiences in Iceland, I went and drank two glasses of water and waited a while before entering the dry sauna. It was at a much lower heat, so I was able to stay in there a bit longer! 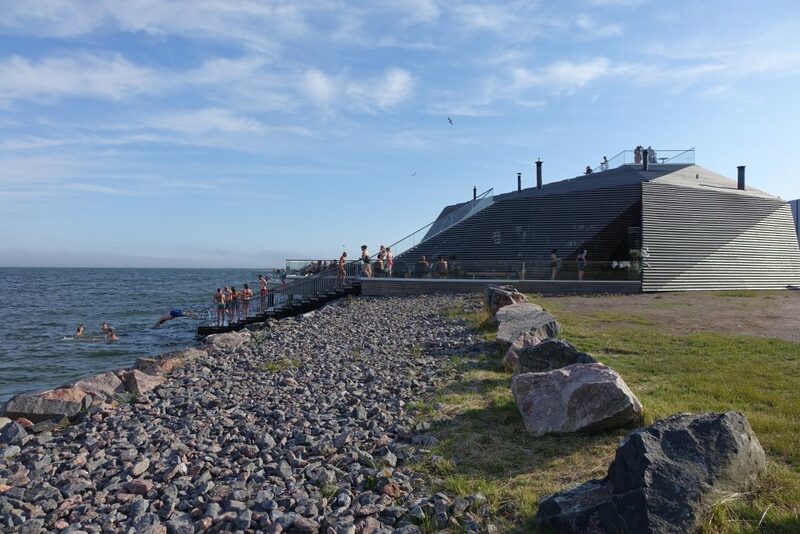 Next, there was only one thing for it – a plunge in the sea, as is the tradition in Finland! 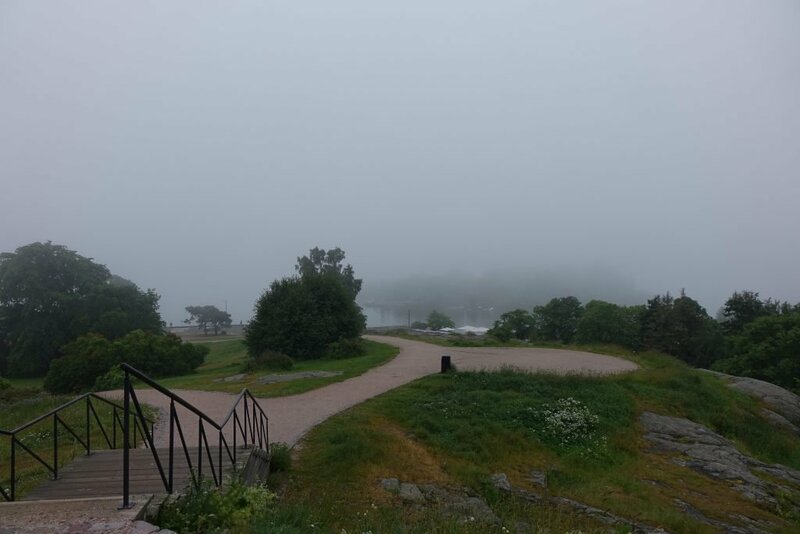 Out the back of the sauna area, there’s steps that lead down into the Baltic. I thought it wouldn’t be that cold as I gingerly headed in. The sun was out after all! But it was absolutely, bracingly, bitterly cold. I managed to get in up to my chest, but sticking my head underwater was out of the question. It was freezing! So, I’ll be honest, I was only in there a couple of seconds. At least I did it though, right? After a shower (again conscious of what happened in Iceland, so taking it easy and slow!) I headed into the restaurant for a bite to eat. 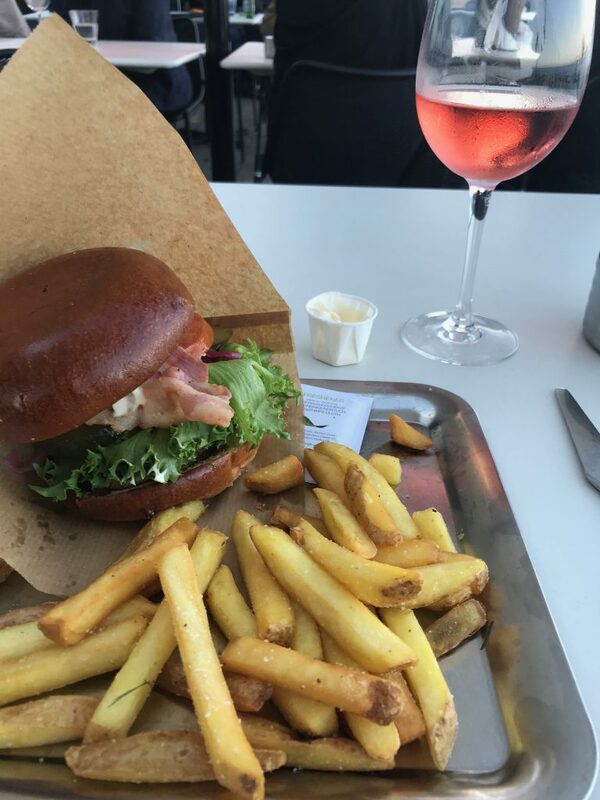 I ordered a glass of vino with my burger (had to be a burger after a long day!) and headed off to the terrace to sit in the sun. It soon became apparent that it’s probably best not to eat outside by the sea. 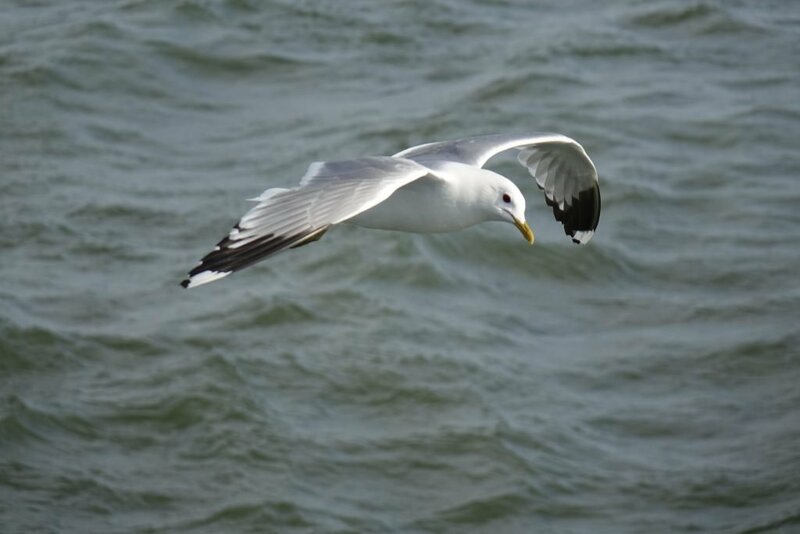 Seagulls were flying through between tables, dive-bombing tables, and came dangerously close to my burger and chips. I managed to fend them off, but a Chinese lady wasn’t so lucky and lost a chip! The burger was great, and totally hit the spot. Just what I needed!